French rabbi; born at Metz in 960; died at Mayence in 1040. He was the founder of Talmudic studies in France and Germany. As he himself says in a responsum reported by R. Meïr of Rothenburg, he owed most of his knowledge to his teacher, Judah ben Meïr ha-Kohen (Sir Léontin), who was one of the greatest authorities of his time. Having lost his first wife, Gershom married a widow named "Bonna" and settledat Mayence, where he devoted himself to teaching the Talmud. He had many pupils from different countries, among whom should be mentioned Eleazar ben Isaac (ha-Gadol ="the Great"), nephew of Simeon ha-Gadol; and Jacob ben Yaḳar, teacher of Rashi. The fame of his learning eclipsed even that of the heads of the academies of Sura and Pumbedita. Questions of religious casuistry were addressed to him from all countries, and measures which he authorized had legal force among all the Jews of Europe. About 1000 he called a synod which decided the following particulars: (1) prohibition of polygamy; (2) necessity of obtaining the consent of both parties to a divorce; (3) modification of the rules concerning those who became apostates under compulsion; (4) prohibition against opening correspondence addressed to another. See Synods, Rabbinical. 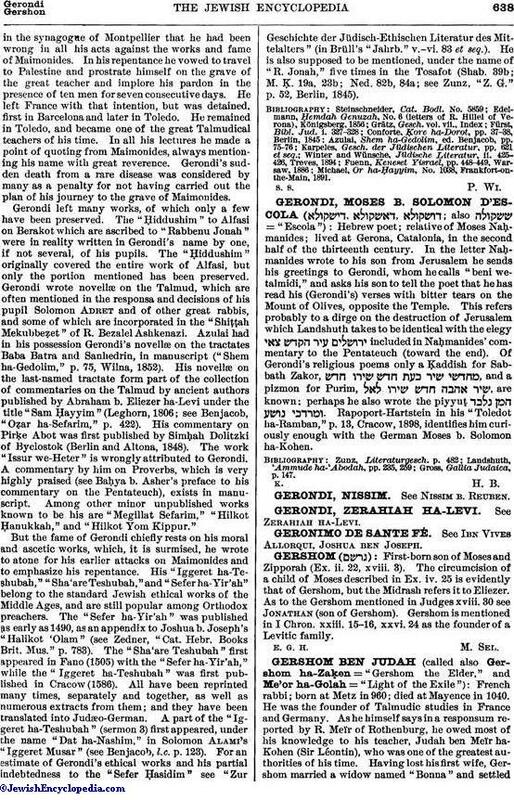 Gershom's literary activity was not less fruitful. He is celebrated for his works in the field of Biblical exegesis, the Masorah, and lexicography. He revised the text of the Mishnah and Talmud, and wrote commentaries on several treatises of the latter which were very popular and gave an impulse to the production of other works of the kind. His seliḥot were inspired by the bloody persecutions of his time. 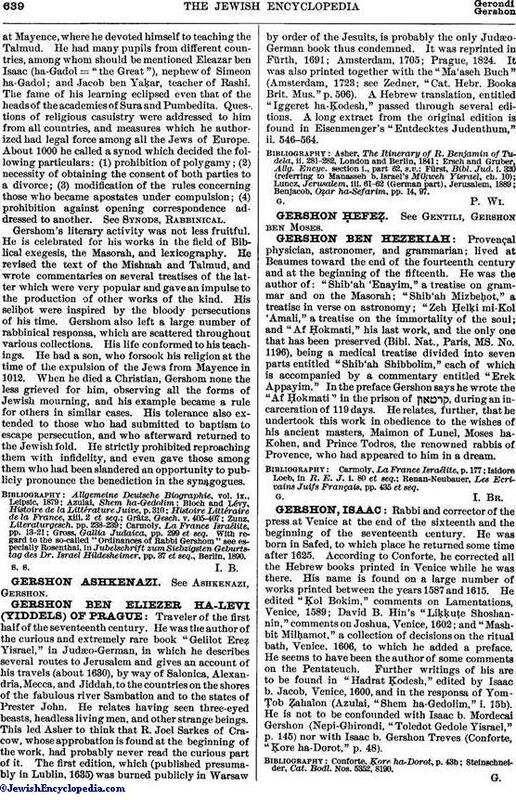 Gershom also left a large number of rabbinical responsa, which are scattered throughout various collections. His life conformed to his teachings. He had a son, who forsook his religion at the time of the expulsion of the Jews from Mayence in 1012. When he died a Christian, Gershom none the less grieved for him, observing all the forms of Jewish mourning, and his example became a rule for others in similar cases. His tolerance also extended to those who had submitted to baptism to escape persecution, and who afterward returned to the Jewish fold. He strictly prohibited reproaching them with infidelity, and even gave those among them who had been slandered an opportunity to publicly pronounce the benediction in the synagogues. Gross, Gallia Judaica, pp. 299 et seq. With regard to the so-called "Ordinances of Rabbi Gershom" see especially Rosenthal, in Jubelschrift zum Siebzigsten Geburtstag des Dr. Israel Hildesheimer, pp. 37 et seq., Berlin, 1890.